After clinching the team's seventh University Athletic Association Championship, the Eagles head to the first rounds of the NCAA Division III Tournament this weekend. The No. 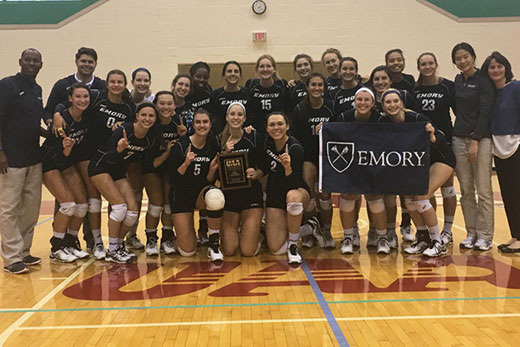 8-ranked Emory volleyball team captured the 30th Annual University Athletic Association Championships on Nov. 5, topping No. 21 Carnegie Mellon in the title match. The win marks the fifth time in the past eight seasons and seventh overall that the Eagles have brought home the UAA conference crown. The Eagles raised their overall record to 30-5 following a 3-0 decision (25-18, 25-17, 25-17) over the Tartans, who slipped to 25-7. Senior Jessica Holler led all players with 12 kills (her 20th double-figure match of the year) and registered a hitting percentage of .474, while also contributing three block assists and three service aces. Senior Kathryn Trinka and sophomore Sydney Leimbach each added seven terminations, with Leimbach hitting .389 and Trinka posting three total blocks. First-year student Sara Carr came through with a big effort, totaling six kills and a team-leading 14 digs. Junior Hannah Billings and sophomore Mady Arles kept the Emory team running by dishing out 18 and 17 assists, respectively. With the UAA championship win, Emory earned the league's automatic berth to the NCAA Division III Tournament, which begins Friday. It will be the Eagles' 21st consecutive appearance in the NCAA Tournament. Emory will be one of 64 programs competing for the 2016 NCAA Division III Championship. The Eagles are part of an eight-team Brockport, New York, Regional with the College at Brockport State University of New York serving as the host institution. Emory's opening-round foe will be the College of New Rochelle. Emory enters the Regional as the No. 1 seed, while New Rochelle is No. 8. Action begins on Friday with four first-round matches with the second rounds being played on Saturday. The regional championship will be played on Sunday, with the winner advancing to the NCAA Quarterfinals in Oshkosh, Wisconsin.